I imagine that cutting down the body of his nephew would have been extremely traumatic. It’s hard for me to understand how John could have committed suicide 30 years later and left his family to deal with the trauma. Very, very sad. Below is the inquest determination from the Sept 28 1883 Galena Weekly Gazette article regarding William’s suicide. It was a long article. Instead of the original single column layout, I modified to fit three columns. The transcribed text is broken into paragraphs to make it easier to read. The dreadful suicide of Esquire Erhard Dittmar, of Derinda, on Tuesday morning, September 17, was followed up by another case of self murder, which occurred last Sunday morning at Council Hill Station, the unfortunate victim being William Davis, aged 22 years, third son of Jacob Davis, a well known and highly respected carpenter and builder of that township. From Mr. John Davis, uncle of the deceased, we learn that the latter was brought home sick about two months ago from Nebraska after an absence from Council Hill of about three years, and that his disease was pronounced to be ulceration of the bowels, from which he was a great sufferer. On Saturday night, William and his father occupied adjoining rooms on the ground floor of the Davis residence, while a sister of the deceased slept upstairs. The door between the two rooms below was partly open so that the father could attend to his son should he need anything during the night. A door also opened out into the back yard from William’s room, the key to the lock being on the inside. On Sunday morning, the father of the young man got up to light the fire, and after doing so, he went into his son’s room to ascertain his condition, and was surprised to find the apartment empty, and the door leading to the back yard slightly ajar. He commenced a search at once about the premises and in a few moments thereafter discovered the lifeless body of his son suspended from the lower limb of a large oak tree standing by the fence in the stable yard. 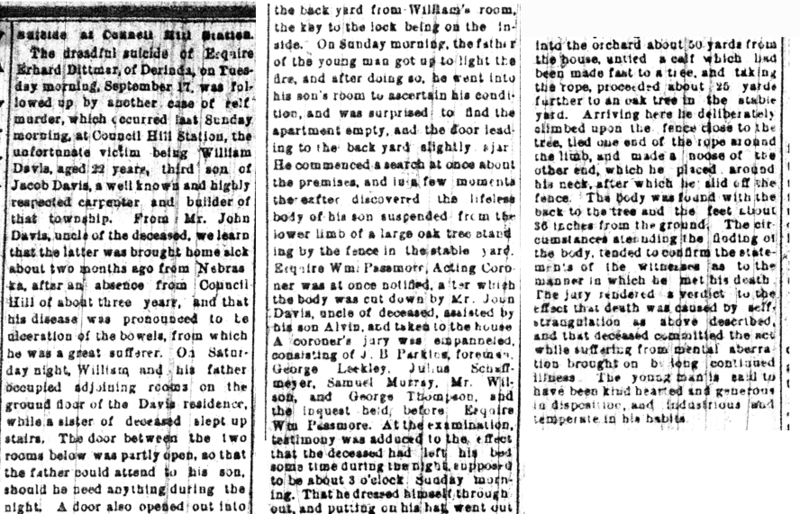 Esquire Wm Passmore, Acting Coroner was at once notified, after which the body was cut down by Mr. John Davis, uncle of deceased, assisted by his son Alvin, and taken to the house. A coroner’s jury was enpanneled [sic], consisting of J.B. Parkins, foremen, George Leckley, Julius Schuffmeyer, Samuel Murray, Mr. Wilson, and George Thompson, and the inquest held before Esquire Wm Passmore. At the examination, testimony was adduced to the effect that the deceased had left his bed some time during the night supposed to be about 3 o’clock Sunday morning. That he dressed himself throughout and putting on his hat went out into the orchard about 50 yards from the house, untied a calf which had been made fast to a tree, and taking the rope, proceeded about 25 yards further to an oak tree in the stable yard. Arriving here he deliberately climbed upon the fence close to the tree, tied on end of the rope around the limb, and made a noose of the other end, which he placed around his neck after which he slid off the fence.The body was found with the back to the tree and the feet about 36 inches from the ground. The circumstances attending the finding of the body, tended to confirm the statements of the witnesses as the manner in which he met his death. The jury rendered a verdict to the effect that death was caused by self strangulation as above described, and that deceased committed the act while suffering from mental aberration brought on by long continued illness. The young man is said to have been kind hearted and generous in disposition and industrious and temperate in his habits.